Nikon 70-210mm F4-5.6 AF NIKKOR Auto Focus Zoom Lens. Condition is used and top lens has a little mould as detailed in images. Dispatched with Royal Mail 2nd Class. Doing a bit of spring cleaning in my lens collection and I'm hoping to find a new owner to this great lens. Used, but good working order. Rear lens cap. I am willing to sort out any issue that is due to a mistake of mine. These make it viable to keep my prices down. The lens is in excellent condition - no scratches/haze/fungus/separation or oil covering the aperture blades. Here I have for sale a nice AF Nikkor 70 - 210 zoom lens. Optics clean and clear, Zooming and focussing nice and smooth. Used but loved SIRIUS 70-210 zoom lens. No mould or mildew. Nikon Nikkor AF 70-210mm f/4.0-5.6 AF Lens. Condition is Used. Dispatched with Royal Mail 1st Class. 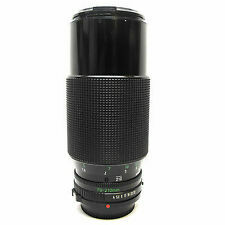 Hey You are bidding on this Vivitar 70-210mm lens f.4.5-5.6 zoom lens for Pentax camera body. This is a lens ive had for a long time, it was given to me second hand and has been in storage for a while. Last time i used it it worked fine. I have adjusted the aperture ring in the photos to demonstrate that it is in good working order. Please checm the pictures for more details! Happy bidding and dont forget to check out my other items! Thanks Vivitar 70-210mm 1:4.5-5.6 MC Macro Focusing Zoom Lens. Pentax KA mount. Condition is Used. Dispatched with Royal Mail 2nd Class. Vivitar Series 1 70-210mm f2.8-4.0 58mm Macro Zoom Lens for Minolta SR with Caps, carry bag and manuals. Nice weighty lens. Any questions please feel free to contact me Dispatched with Royal Mail 2nd Class. 2 x Nikon Lenses 70 - 210 mm & 35 - 70mm. Nikon 1:4 - 5.6. Nikon 1:3.3-4.5. 70 - 210mm. QUICK LINKS. - Inspire our people and partners to unite behind our purpose. - Fight to change policy, practice and public opinion. MIRANDA 70-210MM 1:4.5 - 5.6 MC MACRO Lens For Pentax. Condition is Used. Dispatched with Royal Mail 2nd Class. Condition is Used. LENSE HOOD. Original Canon lens hood fit for this lens. Original Canon case that perfectly fits the lens. Sigma Auto Focus 70-210mm lens for Canon . Condition is Used. Dispatched with Royal Mail 2nd Class. For sale is my Nikon Nikkor AF 70-210 1:4-5.6 zoom lens. There is no fungus, lenses are clean and only very minimal dust as may be expected in a lens of this age. Nikon 70-210mm. Lens Type: Zoom. Min Aperture: f/ 32. Includes lens cap but no mount cap. Mount: AI-S Mount. Grade 2 - Light traces in part of/ throughout the lens. Focal Length: 70-210 mm. As the UK's number one heart charity, the cutting edge research we fund has already made a big difference to people's lives. Lovely Canon (FD fit) 70-210 zoom. in invisible marker - you can just about see it if you look real hard at the right angle (but I can't make it visible on photos). F4-F32, with Auto mode. With Hard case. Tokina 70-210mm f4 - 5.6 Zoom lens - Nikon F monunt - manual focus . Condition is Used. Dispatched with Royal Mail 2nd Class. Complete with hoya 62mm skylight filter. Includes box and case. In very goodcondition, fitted with a Vivitar 1A skylight filter, complete with padded case. In good condition,fitted with a Hoya 1B skylight filter, complete with Hoya padded case. Vivitar series 1 70-210mm. Condition is Used. Minolta MD mount. Dispatched with Royal Mail 2nd Class. Tamron Zoom Lens 70 - 150mm F3.5 Canon FD mounting in good condition. I have a Minolta Tamron Adaptall mount for Minolta which I could substitute for the Canon Mount if required. Nikon 70-210mm Lens. Condition is Used. Dispatched with Royal Mail 2nd Class. A fully working, example of this top quality lens. Useful 1:4 macro feature. Tokina 70-210mm f/4.5 PK Panagor 2x Teleconverter 2 PK-EOS Adaptors. Condition is Used. Dispatched with Royal Mail 2nd Class. Lens and teleconverter in great condition. All glass is free of dust, scratches and fungus. For Pentax cameras but comes with Canon EOS adaptors. This lens is in very good condition and in full working order. It is also supplied with the Skylight (1B) filter and instruction manual. This lens has had a relatively light use, and I can find no visible dust and there is no mould. This lens is in great condition with no fungus or scratches. 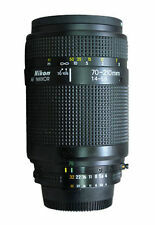 Nikon AF Nikkor 70-210mm f4 autofocus zoom lens. The maximum aperture is f4 at all zoom settings. Excellent condition throughout. No fungus or scratches on the glass. The zoom and aperture markings are bright and clear with no rubbing. Here we have a Pentacon Prakticar 70-210MM F4-5.6 Prakticar Bayonet Mount Zoom Lens. This is a great lens which has a Hoya filter firmly attached at the front, it will need releasing, the lens has a rear lens cap, the focus and aperture are smooth. MINOLTA AF 70-210MM F4 BEERCAN LENS MINOLTA / SONY ALPHA A CAMERA. Lens is in good used condition for age with no damage, however it does have signs of fungus, this does NOT affect the picture quality at all. I’m selling all my Sony kit to purchase a more wife friendly camera! So check out my other listings as more than happy to combine. Can be collected from TA7 area or Cheltenham weekdays. (All other Nikon DSLR will be full autofocus (plase ask if unsure). Nikon Nikkor AF 70-210mm F4 Zoom Lens. Constant F4 and close focus makes this a very versatile lens. Will work with ALL Nikon DSLR's but will only be manual focus on D40, D40x, D60, D3 00, D5 00). A used lens in VGC exhibiting no signs of fungus, zoom creep, etc. 70-210mm range (160-420 equivalent) Sold C/W branded lens cap and compatible body cap. Would suit Olympus pen, Panasonic Micro four thirds etc. Comparatively fast apertures for zoom range. For sale due to upgrade to autofocus equivalent which suits my needs better due to age taking in weight and ease of use considerations. I find EBay's carriage menus a little confusing and although the listing may show an alternative I always choose Hermes 3-5 day tracked delivery, please allow 1 working day for dispatch. Apologies in advance for any confusion this may cause but I have always found this method more cost effective and reliable taking insurance during transit into account. P P is to UK postcode. Macro Ratio: 1:4 (at 210mm). It is multi-coated. Great condition with smooth focus and aperture rings. Filter size: 52mm. Min Focus: 1.1M. Great condition, tested and working, see pics for actual item for sale. Auto f=80-200mm Lens. showing signs of use. Tested with good results on Alpha A230, A380 and A580 and Minolta 600si.